An alphabetical listing of monsters found in ADVANCED DUNGEONS & DRAGONS adventures, including attacks, damage, special abilities, descriptions, and random encounter tables. A must for the serious AD&D game player. This manual contains all the new members, from Abishai to Zygom, including new creatures like the Deadly Pudding, Devas, and Valley Elves. And you'll also have the advantage of the expanded lists of lycanthropes, giants, and other beasts. Monster Manual II (1983), largely by Gary Gygax, is TSR's sixth hardcover for the AD&D game, and its third book of monsters. Though Gygax prepared at least an initial version of the manuscript in September 1982, Monster Manual II wasn't published until GenCon XVI (1983), breaking the pattern of a new AD&D hardcover appearing every year, as had been the case from 1977 through 1981. A Tale of Two Books. Gary Gygax's creative work ground to a virtual halt in 1981 thanks to the increasing amounts of work required to run TSR. That improved in 1982, probably thanks to Kevin Blume coming aboard TSR the previous year to take over operations. The result was new Gary Gygax material in 1982 and 1983. Gygax's most innovative work appeared in the pages of Dragon magazine. In his "From the Sorcerers Scroll" column, Gygax presented a number of rules additions for AD&D, beginning with the creation of cantrips in Dragon #59 (March 1982) and continuing through the introduction of the cavalier in Dragon #72 (April 1983). Meanwhile, in the brand-new "Featured Creatures" columns, Gygax presented new monsters from Dragon #63 (July 1982) to Dragon #69 (January 1983). Each of these columns would form the heart of a new hardcover for AD&D. What's more surprising is the large gap between the two products. Though Gygax completed work on the monster book, Monster Manual II, in September 1982, he didn't finish work on the rules book, Unearthed Arcana (1985), until May 1985. That gap marked Gygax's tenure in California, when the Blume brothers took control of the company, and from which he returned when the company faced severe financial problems just a few years later. Monster Sources. Though the Monster Manual II gives credit only to Gygax, it's actually a compilation of monsters from many different sources. Gygax certainly contributed a large number of the monsters in the book, including the celestials, legendary creatures, genies, elves, and fungi that he'd created for his Dragon column. Gygax's adventure module S4: "The Lost Caverns of Tsojcanth" (1982) - which was virtually a mini-Monster Manual itself, with a full 17 pages of monsters - also provided Monster Manual II with a lot of material. However, many more monsters were created by a variety of authors. Frank Mentzer is known to have created the minimals and the pseudo-undead, while Francois Marcela-Froideval created the basis of the modrons. (The two were often closely associated with Gygax on creative projects of this period.) Design Consultant Jeff Grubb edited all the monsters and filled in missing bits; most notably he created some of the daemons and finished up the modrons - writing stats for the tridrone and both stats and descriptions for the quadrone and all the higher ranks. Many more monsters had originally appeared in AD&D adventures, including the A, C, EX, I, L, S, UK, and WG series. These were of course by a variety of authors. At least one Dragon magazine author scored a contribution too, when Brian Jaeger's faerie dragon from Dragon #62 (June 1982) was selected for the new book. Dragon would later use it as a symbol of their additions to the AD&D game by featuring it on the cover to Dragon #100 (August 1985). A Redesigned Book. 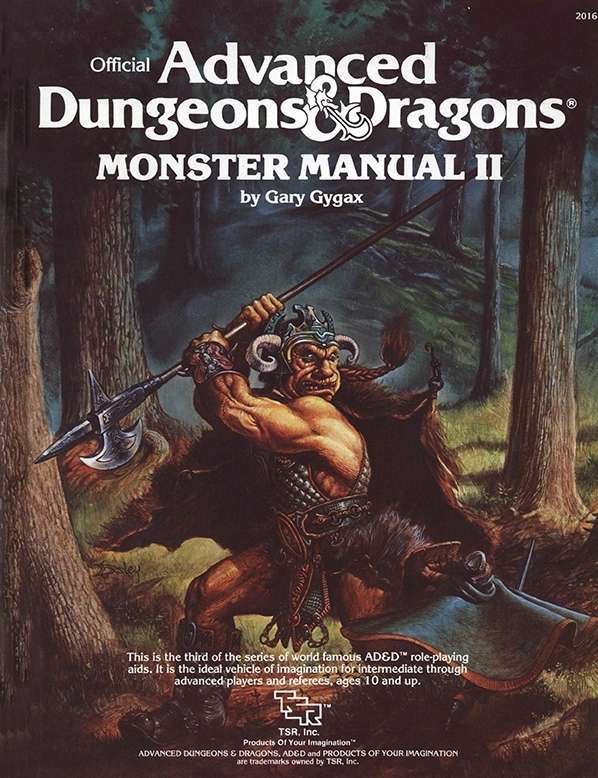 Monster Manual II was the first AD&D hardcover released in TSR's redesigned format - which included an orange spine and a regularized "Official AD&D" logo for the cover. All of the previous hardcovers would be reprinted in the new trade dress thereafter - except Fiend Folio (1981), which was reprinted for the last time around 1982. A Lawsuit Waiting to Happen. A previous lawsuit between TSR and Dave Arneson had been settled in March 1981, giving Arneson 2.5% royalties on the sale of a specific set of AD&D rulebooks and any revisions of those books. TSR paid Arneson about $100,000 royalties on Monster Manual II in the first year after its release, but then stopped payment and claimed that it wasn't covered by the settlement; they also began withholding payments to Arneson to offset the $100,000 paid out. Arneson filed David L. Arneson v. TSR Hobbies Inc. on November 14, 1984, to sue for royalties on the Monster Manual II. Arneson won his case in March 1985 on the admittedly suspect decision by the judge that the Monster Manual II was indeed a "revised edition" of the Monster Manual. Expanding the Outer Planes. Monster Manual II is generally full of pretty high-level monsters. Many of them come from the Inner or Outer Planes, offering up one of the largest expansions of the Great Wheel ever. This included tons of new devils and demons, fleshing out Hell and the Abyss - though one demon, the Goristro, went missing and would be published instead in Dragon #91 (November 1984). Daemons were also introduced as a coherent group, after some scattered mentions in the Fiend Folio. The least successful new outer race was probably the demodands of Tarterus. They were derived from the deodands of Jack Vance's Dying Earth. Despite not being particularly popular, they've since appeared in the Monstrous Compendium Outer Planes Appendix (1991) and the 3e Fiend Folio (2003). On the other hand, the most successful outer races of the new book were likely the celestials and the modrons. The celestials are very scattered in Monster Manual II and definitely aren't called angels. They appear under separate entries for devas, planetars, and solars. In later editions they'd be grouped as aasimon or as celestials. The modrons appear in much the same form that they'd be seen throughout Planescape and other D&D books. The Inner Planes also got a little attention with a set of para-elementals (ice, smoke, magma, and ooze) and one quasi-elemental (lightning). The para-elemental planes were of course where two elemental planes overlapped, as had been introduced in Deities & Demigods (1980). The quasi-elemental planes were a newer concept, marking the overlapping of an elemental plane with either the positive or negative material plane. Gygax had explained this very recently in Dragon #73 (May 1983). More New Monsters. Monster Manual II also saw the introduction of the quickling and the entirely infamous tarrasque. An Irregular Game System. Monster Manual II today helps to highlight the irregularity of AD&D as a game system in those days of yore. In Dragon #90 (October 1984) Gygax had to print up a new list of monsters affected by the charm person spell that included the critters from Fiend Folio and Monster Manual II - because no one back in the '80s had thought to includes monster "types" in their descriptions. About the Creators. At the same time that Gygax was writing new material for Dragon magazine, he was also preparing a number of supplements based upon his own Greyhawk campaign. This resulted in the publication of S4: "The Lost Caverns of Tsojcanth" (1982), WG4: "The Forgotten Temple of Tharizdun" (1982), EX1: "Dungeonland" (1983), and EX2: "The Land Beyond the Magic Mirror" (1983). This title was added to our catalog on February 05, 2013.